Your hardwood floor represents a significant value to your home. They add a class and atmosphere that is unparalleled in its ability to attract potential buyers. If you own a hardwood floor, you already know by now just how fragile it can be when it comes to spills, accidents or scratches. We’re going to show you some strategies for repairing damage done to hardwood, focusing primarily on scratches and gouges. When your hardwood floor is injured, assess how bad the situation is. 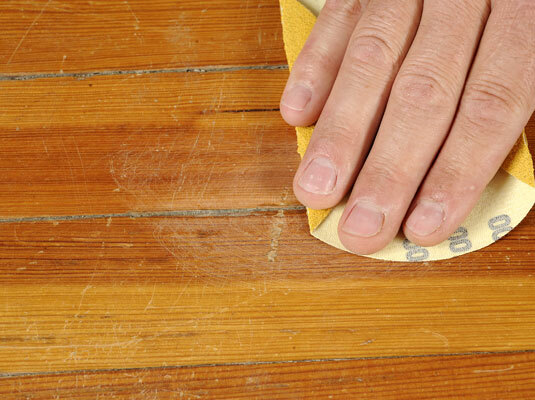 A scratch is generally a visible, but not deep, marking on your hardwood floors surface. These can be caused by the improper transportation of furniture, shattered glass, or a myriad of other things. In contrast, a gouge is a deep indentation caused by traumatic blunt force. Identify which situation you are dealing with before you initiate any kind of repair. This will save you an incredible amount of time, money, and frustration. Surface scratches can easily be fixed by a Tibetan Almond Stick, while deeper scratches may require a variety of putties. Follow the instructions on the package for specific use, as each product will vary slightly in application. Another option for treating your deeper gouges is to use wood filler. Unfortunately, wood filler won’t often match the color of the wood, though you can stain over it once it has been applied. In rare circumstances, a floor is so damaged that it leaves you no choice but to refinish it. This might require a professional depending on your budget and the size of the area in question. Hardwood floors are a popular type of flooring which add warmth, beauty and timeless style to your home. Considering their value, you should look to protect your investment from any excess substances which can cause it harm. Prevention is the best course of action when approaching hardwood floor upkeep. Try fixing rubber pads on the legs of chairs and tables so that your hardwood flooring will be protected when furniture is jostled, or consider soft paw caps for your animals.